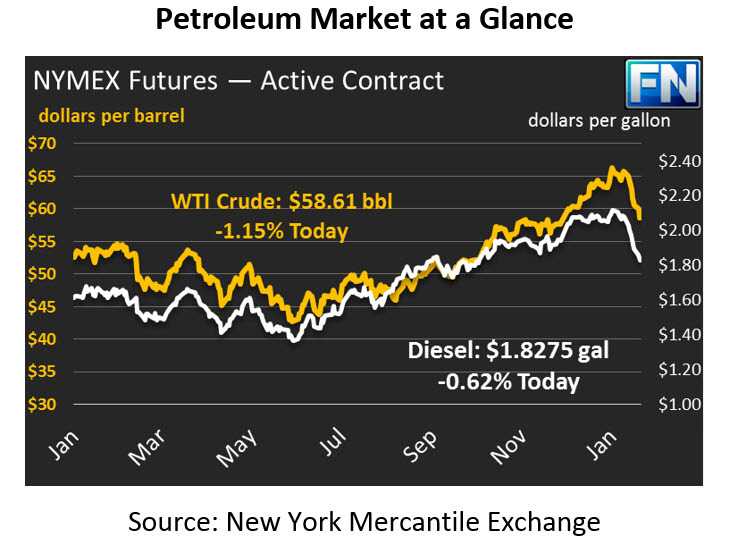 Yesterday saw sparks of a price rally, with crude prices briefly peaking above $60. The enthusiasm didn’t last, however, and prices ended just slightly above the opening price. Today, crude prices are back to last week’s downward trend, with prices currently at $58.61, a loss of 68 cents (1.15%) since yesterday’s close. Refined fuels broke free of crude prices and plummeted once again – diesel prices fell by 1.2 cents, while gasoline closed with a 2.4 cent loss. Today, both products are more than a penny lower. The fact that refined products fell while crude oil remained positive likely shows the impacts of financial markets on crude oil. Investors are flocking to crude (and other commodities) as equities appear near their peak and bond markets are threatened by rising interest rates. Diesel is currently trading at $1.8275, down over a penny (.62%). Gasoline has lost another 85 points (.51%) this morning to trade at $1.6700. Markets were a bit rattled by falling production data from Venezuela. The country has seen a production plunge due to financial instability, causing prices to rise. Interestingly, Venezuela’s production loss over the past two years has been roughly half a million barrels. As a member of OPEC, Venezuela could be considered the all-star in terms of production cuts – without their contribution, OPEC likely would have struggled to meet their collective production targets. After bearish reports from the EIA STEO (last week) and the OPEC Monthly Oil Market Report, markets fundamentally are struggling to buck the downward pressure from equities markets. The first half of 2018 is forecast to be a net inventory build, which could keep prices suppressed. Certainly as refineries go through seasonal maintenance in the coming weeks, demand for crude oil will fall. On the other hand, less fuel being produced will lead to steeper draws of refined fuels, giving fuel prices a boost.